Baylor’s Model Organization of American States (MOAS) team won the Distinguished Delegation Award at the 12th Annual MOAS Conference hosted by St. Mary’s University in San Antonio, Texas, from November 6-8, 2008. This is the eleventh time Baylor has received one of the two team awards at the conference. The conference was attended by 15 universities from Texas, New Mexico, Ohio, and three from Mexico. There were 24 countries represented. Students worked to resolve issues relating to the hemisphere that included multidimensional security, human trafficking, alleviation of poverty, and sustainable development. 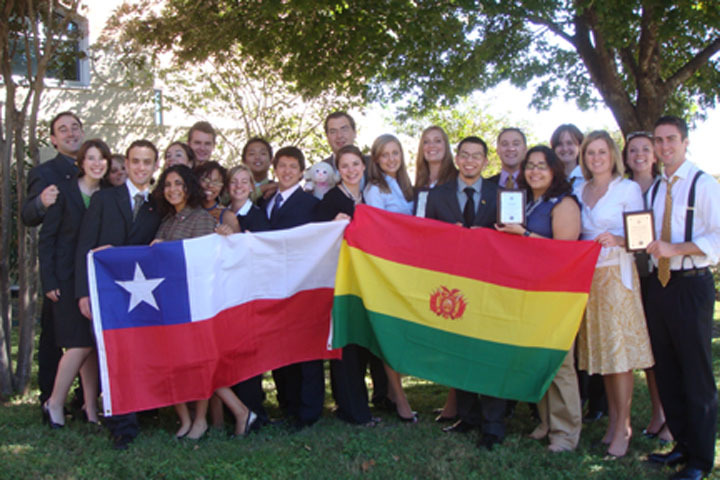 Baylor University represented Bolivia and Chile and the President of the Conference was Baylor’s own Joshua Hyles (graduate student in History, Mabank). The keynote address was delivered by Ambassador William Eaton, who served as the U.S. Ambassador to the Republic of Panama from 2001 to 2008 and who is now Ambassador in Residence at the University of Texas at Austin. Baylor Head Delegate for Bolivia Seth Reed (senior in Political Science and Economics, Cassville, MO), and Torie Rhodes (sophomore in International studies and French, Pasadena, CA), won Outstanding Delegate awards in the Special Committee on Migration. Co-Head Delegate for Bolivia Renee Sanchez (senior in Biology and Spanish, Brownsville), and Hunter Klein (junior in Political Science, Tomball), won Distinguished Delegate awards in the Committee on Juridical and Political Affairs. Baylor’s team, as a whole, won the Distinguished Delegation award for the conference. Other team members included Baylor Head Delegate for Chile Manny Muñoz (senior in Neuroscience, San Antonio), who was elected the President for next year’s conference, and Megan McNerney (senior in International Studies and Economics, Troy, OH), who was selected as the outstanding chair of the conference. Additionally, Cassidy Ford (senior, University Scholars, Phoenix, AZ), served as the chair of the Inter-American Commission on Human Rights; and Brittney Quesada (freshman in Political Science, Missouri City), served as a rapporteur for the conference. Also competing for Baylor were Elizabeth Wilson (graduate student in History, Kingwood); Tomás de Prat Gay (junior in Engineering, Mendoza, Argentina); Ariel Alexander, (senior in International Studies and French, San Antonio); T.J. Cheavens (senior in International Studies, Cedar Park); Krystal Dau, (senior in International Studies, Las Vegas, NV); Ricardo Felix (senior in International Studies, Waco); Monica Uribe, (senior in Music Performance, Harlingen); Co-Head Delegate for Chile Daisy Marchena (junior in International Studies, Houston); Jolie Shelton (junior in Psychology, Mendoza, Argentina); Tyler Talbert (junior in International Studies, Waco); Leisel Walters, (junior in International Studies, Tegucigalpa, Honduras); Ally Gutiérrez, (freshman in Political Science, Cypress); Michael Lyssy (freshman in Political Science, Falls City); and Eldrin Ofina (freshman in Biology, Cypress). The team was coached by Dr. Joan E. Supplee, Department of History.